^ Schmadel, Lutz. Dictionary of minor planet names 5th. Germany: Springer. 2003: 15. ISBN 978-3-540-00238-3. ^ Simpson, D. P. Cassell's Latin Dictionary 5th. London: Cassell Ltd. 1979: 883. ISBN 978-0-304-52257-6. ^ 4.0 4.1 4.2 4.3 1 Ceres. JPL Small-Body Database Browser. [2015-01-08]. （原始内容存档于2012-08-04）. ^ 5.0 5.1 AstDyS-2 Ceres Synthetic Proper Orbital Elements. Department of Mathematics, University of Pisa, Italy. [2011-10-01]. （原始内容存档于2011-10-05）. ^ Chamberlain, Matthew A.; Sykes, Mark V.; Esquerdo, Gilbert A. Ceres lightcurve analysis – Period determination. Icarus. 2007, 188 (2): 451–456. Bibcode:2007Icar..188..451C. doi:10.1016/j.icarus.2006.11.025. ^ 9.0 9.1 9.2 Asteroid Ceres P_constants (PcK) SPICE kernel file. [2015-11-05]. ^ 10.0 10.1 10.2 10.3 10.4 10.5 10.6 10.7 Li, Jian-Yang; McFadden, Lucy A.; Parker, Joel Wm. Photometric analysis of 1 Ceres and surface mapping from HST observations. Icarus. 2006, 182 (1): 143–160 [2007-12-08]. Bibcode:2006Icar..182..143L. doi:10.1016/j.icarus.2005.12.012. ^ 11.0 11.1 11.2 11.3 11.4 11.5 11.6 Rivkin, A. S.; Volquardsen, E. L.; Clark, B. E. The surface composition of Ceres:Discovery of carbonates and iron-rich clays (PDF). Icarus. 2006, 185 (2): 563–567 [2007-12-08]. Bibcode:2006Icar..185..563R. doi:10.1016/j.icarus.2006.08.022. ^ 12.0 12.1 Menzel, Donald H.; and Pasachoff, Jay M. A Field Guide to the Stars and Planets 2nd. Boston, MA: Houghton Mifflin. 1983: 391. ISBN 0395348358. ^ Angelo, Joseph A., Jr. Encyclopedia of Space and Astronomy. New York: Infobase. 2006: 122. ISBN 0-8160-5330-8. ^ 15.0 15.1 Saint-Pé, O.; Combes, N.; Rigaut F. Ceres surface properties by high-resolution imaging from Earth. Icarus. 1993, 105 (2): 271–281. Bibcode:1993Icar..105..271S. doi:10.1006/icar.1993.1125. ^ Ceres. Dictionary.com. Random House, Inc. [2007-09-26]. （原始内容存档于2011-10-05）. ^ Stankiewicz, Rick. A visit to the asteroid belt. Peterborough Examiner. 2015-02-20 [2015-05-29]. ^ McCord, T. B.; Sotin, C. Ceres: Evolution and current state. Journal of Geophysical Research: Planets. 2005-05-21, 110 (E5): E05009 [2015-03-07]. Bibcode:2005JGRE..110.5009M. doi:10.1029/2004JE002244. ^ Landau, Elizabeth; Brown, Dwayne. NASA Spacecraft Becomes First to Orbit a Dwarf Planet. NASA. 2015-03-06 [2015-03-06]. ^ Dawn Spacecraft Begins Approach to Dwarf Planet Ceres. [2014-12-29]. ^ 22.0 22.1 Rayman, Marc. Dawn Journal: Ceres Orbit Insertion!. Planetary Society. 2015-03-06 [2015-03-06]. ^ Plait, Phil. The Bright Spots of Ceres Spin Into View. Slate. 2015-05-11 [2015-05-30]. ^ O'Neill, I. Ceres' Mystery Bright Dots May Have Volcanic Origin. Discovery Communications. 2015-02-25 [2015-03-01]. ^ Landau, E. 'Bright Spot' on Ceres Has Dimmer Companion. Jet Propulsion Laboratory. 2015-02-25 [2015-02-25]. （原始内容存档于2015-02-26）. 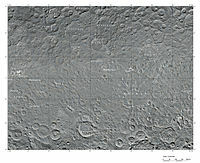 ^ Lakdawalla, E. At last, Ceres is a geological world. Planetary Society. 2015-02-26 [2015-02-26]. 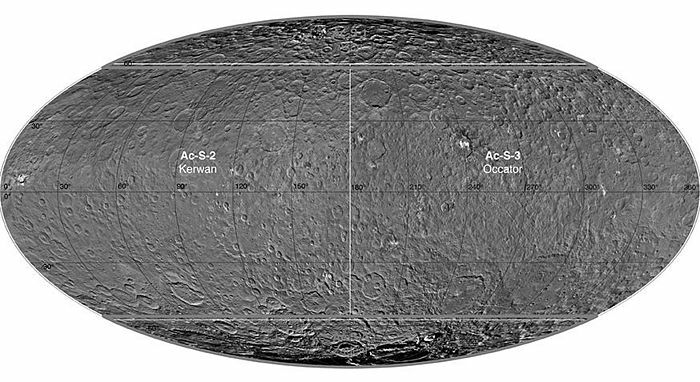 ^ 27.0 27.1 LPSC 2015: First results from Dawn at Ceres: provisional place names and possible plumes. ^ Atkinson, Nancy. Bright Spots on Ceres Likely Ice, Not Cryovolcanoes. Universe Today. 2015-03-03 [2015-03-04]. ^ Ceres RC3 Animation. www.jpl.nasa.gov. 2015-05-11 [2015-07-31]. ^ 30.0 30.1 Landau, Elizabeth. New Clues to Ceres' Bright Spots and Origins. NASA. 2015-12-09 [2015-12-10]. ^ Dawn data from Ceres publicly released: Finally, color global portraits!. www.planetary.org. [2015-11-09]. ^ 32.00 32.01 32.02 32.03 32.04 32.05 32.06 32.07 32.08 32.09 32.10 Hoskin, Michael. Bode's Law and the Discovery of Ceres. Observatorio Astronomico di Palermo "Giuseppe S. Vaiana". 1992-06-26 [2007-07-05]. （原始内容存档于2010-01-18）. ^ 33.0 33.1 33.2 33.3 Hogg, Helen Sawyer. The Titius-Bode Law and the Discovery of Ceres. Journal of the Royal Astronomical Society of Canada. 1948, 242: 241–246. Bibcode:1948JRASC..42..241S. ^ Hoskin, Michael. The Cambridge Concise History of Astronomy. Cambridge University press. 1999: 160–161. ISBN 978-0-521-57600-0. ^ Landau, Elizabeth. Ceres: Keeping Well-Guarded Secrets for 215 Years. NASA. 2016-01-26 [2016-01-26]. ^ 36.0 36.1 36.2 36.3 36.4 36.5 36.6 Forbes, Eric G. Gauss and the Discovery of Ceres. Journal for the History of Astronomy. 1971, 2: 195–199. Bibcode:1971JHA.....2..195F. ^ Clifford J. Cunningham. The first asteroid: Ceres, 1801–2001. Star Lab Press. 2001. ISBN 978-0-9708162-1-4. ^ Klein, Felix; Hermann, Robert. Development of mathematics in the 19th century. Math Sci Press. 1979. ISBN 9780915692286. ^ Hilton, James L. Asteroid Masses and Densities (PDF). U.S. Naval Observatory. [2008-06-23]. ^ Foderà Serio, G.; Manara, A.; Sicoli, P. Giuseppe Piazzi and the Discovery of Ceres. (编) W. F. Bottke Jr.; A. Cellino; P. Paolicchi; R. P. Binzel. Asteroids III (PDF). Tucson, Arizona: University of Arizona Press. 2002: 17–24 [2009-06-25]. ^ Gould, B. A. On the symbolic notation of the asteroids. Astronomical Journal. 1852, 2 (34): 80. Bibcode:1852AJ......2...80G. doi:10.1086/100212. ^ Cerium: historical information. Adaptive Optics. [2007-04-27]. ^ Cerium. 牛津英語詞典 (第三版). 牛津大學出版社. 2001 （英语）. ^ Amalgamator Features 2003: 200 Years Ago. 2003-10-30 [2006-08-21]. （原始内容存档于2006-02-07）. ^ 47.0 47.1 47.2 Hilton, James L. When Did the Asteroids Become Minor Planets?. 2001-09-17 [2006-08-16]. （原始内容存档于2010-01-18）. ^ Herschel, William. Observations on the two lately discovered celestial Bodies.. 1802-05-06. （原始内容存档于2011-10-05）. ^ Battersby, Stephen. Planet debate: Proposed new definitions. New Scientist. 2006-08-16 [2007-04-27]. （原始内容存档于2011-10-05）. ^ Connor, Steve. Solar system to welcome three new planets. NZ Herald. 2006-08-16 [2007-04-27]. （原始内容存档于2011-10-05）. ^ Gingerich, Owen; 等. The IAU draft definition of "Planet" and "Plutons". IAU. 2006-08-16 [2007-04-27]. （原始内容存档于2011-10-05）. ^ The IAU Draft Definition of Planets And Plutons. SpaceDaily. 2006-08-16 [2007-04-27]. （原始内容存档于2010-01-18）. ^ Question and answers 2. IAU. [2008-01-31]. （原始内容存档于2011-10-05）. ^ Spahr, T. B. MPEC 2006-R19: EDITORIAL NOTICE. Minor Planet Center. 2006-09-07 [2008-01-31]. （原始内容存档于2011-10-05）. the numbering of "dwarf planets" does not preclude their having dual designations in possible separate catalogues of such bodies. ^ Lang, Kenneth. The Cambridge Guide to the Solar System. Cambridge University Press. 2011: 372, 442. ^ NASA/JPL, Dawn Views Vesta, 2 August 2011 WebCite的存檔，存档日期2011-10-05 ("Dawn will orbit two of the largest asteroids in the Main Belt"). ^ de Pater; Lissauer. Planetary Sciences 2nd. Cambridge University Press. 2010. ISBN 978-0-521-85371-2. ^ Mann; Nakamura; Mukai. Small bodies in planetary systems. Lecture Notes in Physics 758. Springer-Verlag. 2009. ISBN 978-3-540-76934-7. ^ Spahr, T. B. MPEC 2006-R19: EDITORIAL NOTICE. Minor Planet Center. 2006-09-07 [2008-01-31]. the numbering of "dwarf planets" does not preclude their having dual designations in possible separate catalogues of such bodies. ^ 61.0 61.1 Cellino, A.; 等. Spectroscopic Properties of Asteroid Families. Asteroids III (PDF). University of Arizona Press. 2002: 633–643 (Table on p. 636). Bibcode:2002aste.conf..633C. ^ Kelley, M. S.; Gaffey, M. J. A Genetic Study of the Ceres (Williams #67) Asteroid Family. Bulletin of the American Astronomical Society. 1996, 28: 1097. Bibcode:1996BAAS...28R1097K. ^ Williams, David R. Asteroid Fact Sheet. 2004. （原始内容存档于2010-01-18）. ^ Kovačević, A. B. Determination of the mass of Ceres based on the most gravitationally efficient close encounters. Monthly Notices of the Royal Astronomical Society. 2011, 419 (3): 2725–2736. Bibcode:2012MNRAS.419.2725K. arXiv:1109.6455. doi:10.1111/j.1365-2966.2011.19919.x. ^ Christou, A. A. Co-orbital objects in the main asteroid belt. Astronomy and Astrophysics. 2000, 356: L71–L74. Bibcode:2000A&A...356L..71C. ^ Christou, A. A.; Wiegert, P. A population of Main Belt Asteroids co-orbiting with Ceres and Vesta. Icarus. January 2012, 217 (1): 27–42. Bibcode:2012Icar..217...27C. ISSN 0019-1035. arXiv:1110.4810. doi:10.1016/j.icarus.2011.10.016. ^ Solex numbers generated by Solex. [2009-03-03]. （原始内容存档于2009-04-29）. ^ Rayman, Marc D. Dawn Journal, May 28, 2015. Jet Propulsion Laboratory. 2015-05-28 [2015-05-29]. （原始内容存档于2015年5月30日）. ^ 70.0 70.1 Pitjeva, E. V. High-Precision Ephemerides of Planets—EPM and Determination of Some Astronomical Constants. Solar System Research. 2005, 39 (3): 176. Bibcode:2005SoSyR..39..176P. doi:10.1007/s11208-005-0033-2. ^ 74.0 74.1 74.2 74.3 74.4 Carry, Benoit; 等. Near-Infrared Mapping and Physical Properties of the Dwarf-Planet Ceres (PDF). Astronomy & Astrophysics. 2007, 478 (1): 235–244. Bibcode:2008A&A...478..235C. arXiv:0711.1152. doi:10.1051/0004-6361:20078166. （原始内容 (PDF)存档于2008-05-30）. ^ 75.0 75.1 75.2 Staff. Keck Adaptive Optics Images the Dwarf Planet Ceres. Adaptive Optics. 2006-10-11 [2007-04-27]. ^ 76.0 76.1 Largest Asteroid May Be 'Mini Planet' with Water Ice. HubbleSite. 2005-09-07 [2006-08-16]. （原始内容存档于2011-10-05）. ^ News – Ceres Spots Continue to Mystify in Latest Dawn Images. NASA/JPL. 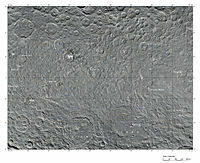 ^ USGS: Ceres nomenclature (PDF). [2015-07-16]. ^ Rayman, Marc. 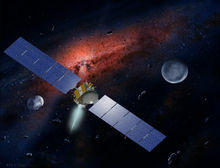 Now Appearing At a Dwarf Planet Near You: NASA's Dawn Mission to the Asteroid Belt (演講). Foothill College, Los Altos, CA. 2015-04-08. ^ Landau, Elizabeth. Ceres Animation Showcases Bright Spots. NASA. 2015-05-11 [2015-05-13]. ^ 81.0 81.1 Witze, Alexandra. Mystery haze appears above Ceres’s bright spots. Nature News. 2015-07-21 [2015-07-23]. ^ Dawn at Ceres: A haze in Occator crater?. ^ Redd, Nola Taylor. Water Ice on Ceres Boosts Hopes for Buried Ocean [Video]. Scientific American. [2016-04-07]. ^ PIA20348:從LAMO看見的阿胡拉山. Jet Propulsion Lab. 2016-03-07 [2016-04-14]. ^ Carey, Bjorn. Largest Asteroid Might Contain More Fresh Water than Earth. SPACE.com. 2005-09-07 [2006-08-16]. ^ 88.0 88.1 88.2 88.3 88.4 88.5 88.6 88.7 McCord, Thomas B. Ceres: Evolution and current state. Journal of Geophysical Research. 2005, 110: E05009. doi:10.1029/2004JE002244. ^ Zolotov, M. Y. 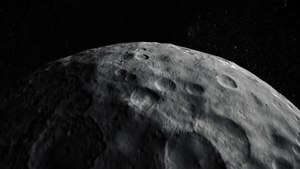 Is Ceres Differentiated?. American Geophysical Union, Fall Meeting 2008. December 2008. Bibcode:2008AGUFM.P51C1424Z. ^ Hubble Directly Observes Planet Orbiting Fomalhaut. Hubblesite. 2008-11-13 [2009-07-02]. ^ Observations reveal curiosities on the surface of asteroid Ceres. [2006-08-16]. ^ NASA's Dawn Prepares for Trek Toward Dwarf Planet. NASA. [2012-09-01]. ^ Rayman, Marc. Dawn Journal: Maneuvering Around Ceres. Planetary Society. 2014-03-03 [2015-03-06]. ^ Rayman, Marc. Dawn Journal: Explaining Orbit Insertion. Planetary Society. 2014-04-30 [2015-03-06]. ^ Rayman, Marc. 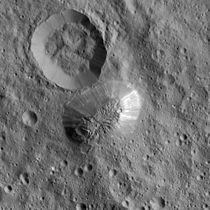 Dawn Journal: HAMO at Ceres. Planetary Society. 2014-06-30 [2015-03-06]. ^ Rayman, Marc. Dawn Journal: From HAMO to LAMO and Beyond. Planetary Society. 2014-08-31 [2015-03-06]. ^ Landau, Elizabeth. New Names and Insights at Ceres. NASA. 28 July 2015 [28 July 2015]. ^ Landau, Elizabeth; Dyches, Preston. Fly Over Ceres in New Video. NASA. 2015-06-08 [2015-06-09]. James L. Hilton, U.S. Naval Observatory Ephemerides of the Largest Asteroids The Astronomical Journal, Vol. 117 pp. 1077 (1999). Hilton, James L. U.S. Naval Observatory Ephemerides of the Largest Asteroids. The Astronomical Journal. 1999, 117 (2): 1077. Bibcode:1999AJ....117.1077H. doi:10.1086/300728.